Scale Out File & Object Storage Appliances: Hardware/software appliances which serve as self-contained repositories for scale-out file and object storage. 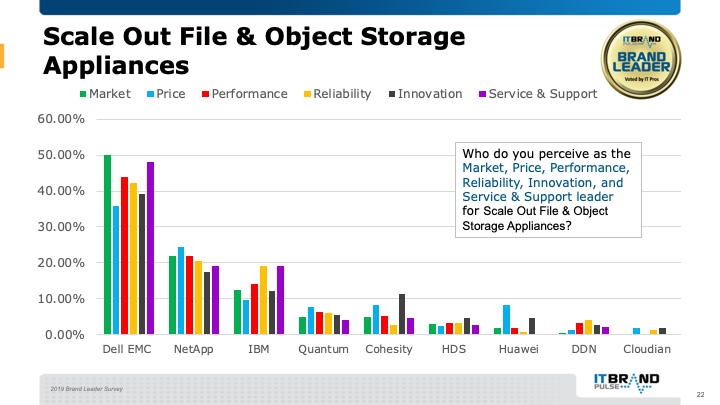 In this newly-added category, Dell EMC was the clear winner across the board for Scale Out File & Object Storage Appliances, as IT Pros chose the company for leadership in Market, Price, Performance, Reliability, Innovation, and Service & Support. NetApp finished second as Market leader, followed by IBM in third.